We are looking for a brilliant, policy-savvy academic consortia to work with us to improve the body of evidence on the measurement of wellbeing in a way that’s useful for policy makers and practitioners. The Economic and Social Research Council (ESRC) and the Arts and Humanities Research Council (AHRC), in partnership with the Centre, are offering to fund one project up to £550,000 (100% fEC), of which the Research Councils will contribute 80% of the full economic costs. Measurement enables us to make comparisons, track progress and articulate what success looks like using verifiable indicators. But measurement is also difficult, particularly when the phenomenon you are trying to measure is as complex as wellbeing. And imperfect measurement can focus attention in the wrong places. The measurement of wellbeing has come a long way in recent years. We now have an agreed indicator set from the ONS, which includes four subjective measures of wellbeing. There is a growing recognition of the importance and validity, particularly of subjective measures of wellbeing, to understand the impact of government policy and local interventions. 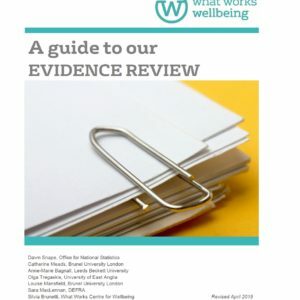 But as the appetite to apply a wellbeing lens grows, the challenges and limitations of our existing toolkit of measures raises some important questions for research, policy and practitioners alike. 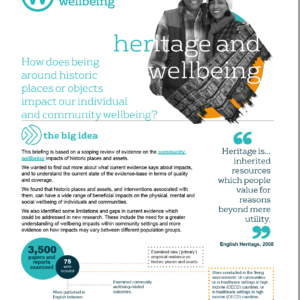 How do you account for who’s wellbeing is affected, and what weightings would be appropriate to ensure policies improve overall wellbeing as well as reduce wellbeing inequalities? How do wellbeing goals at a central level translate to measures that can be measured and implemented by different agencies? How would you account for tradeoffs between different determinants of wellbeing? What does the use of a single measure for wellbeing, such as life satisfaction miss or under-emphasise in terms of the aspects of life and society that we value (eg. power, sustainability) and how can these be accounted for? It is questions like these that we are hoping that the Methods and Measures project will address. We are looking forward to receiving proposals from teams of academics that want to work with us to explore some of these complex conceptual and empirical issues, in a way that will demonstrate both the value and pragmatism of a wellbeing approach, and working with that team to develop, translate and apply the outputs of this research project. We've always done it, so why don't we measure it?